"Rate of decline" simply refers to the fact that the losses have been smaller each of the last 2 days on a percentage basis. Unfortunately the study is not being confirmed by the SPX, which closed up slightly on Friday. It will be interesting to see how it turns out, but I've discounted the study in this instance due to the SPX non-confirmation. On Monday QQQQ posted a higher high and a lower low than Friday. This is often referred to as an “outside day”. Interestingly, Friday was also an outside day. Two outside days in a row is quite rare. This was only the 19th time it’s been done since 2000. Looking at performance following the other 18 times shows some compelling results. These appear to be quite positive implications. 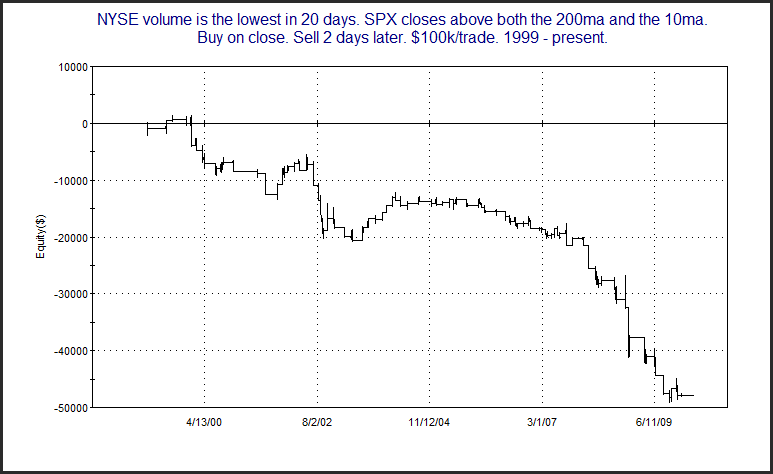 They also confirm the December study where I looked at back to back outside days in SPY. On February 11th the market put in a Follow Through Day according to the original IBD definition requiring at least a 1% rise in one of the major indices on rising volume. I mentioned the Follow Through Day and dedicated a few posts to it in mid-February. The S&P is now less than 1% from new highs and very close to hitting a level that that would qualify the current rally as “successful” based on the rules I set up in the original Follow Through Day test a couple of years ago. This would mean the lesser of 1) a new high or 2) a rally twice as large as the distance from the close of the Follow Through Day to the bottom of the downmove. Meanwhile the Russell 2000 is already hitting new highs. In the last few years IBD has changed their rules and stated that a 1.7% rally on higher volume should be required instead of a 1% rally. Ironically the first major index to actually put in a 1.7% rally on higher volume since the February bottom is the Russell 2000, which did it on Friday - as it was hitting new highs. Not a great bottom call when you’re already at new highs. Over the last few years I’ve suggested ignoring the new rule. 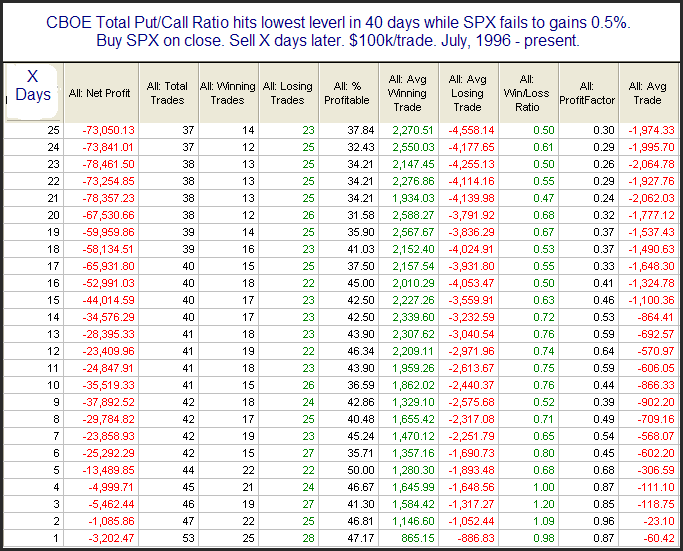 In a study I did a little over 2 years ago I showed how waiting for a 1.7% FTD would have missed several rallies. The current instance now serves as yet another example. Not that I a see a huge value in the 1% FTD rule, but it has been at least marginally effective and can be used to set up a positive risk/reward scenario. Additionally, requiring a 1.7% FTD not only puts you at risk of missing the rally but it also hasn’t proven to be any more predictive than the original 1% requirement. 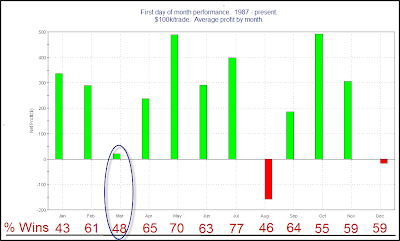 Does Tuesday's Weak Finsh Suggest A Pullback Is Coming? 1) 2008 - The Charts page which tracks a fair amount of indicators discussed in some of the studies – several of which are unique to Quantifiable Edges. 2) 2008 - The Systems page with numbered systems. Originally when I had a system that would trigger a signal in a stock or ETF I would just publish the rules in that night’s Letter. Subscribers wanted a database of the published systems along with their rules. I also threw in Tradestation code for any Tradestation subscribers. 3) 2008 - The triggers spreadsheet. Shortly after the Systems Page was created I decided to create a spreadsheet that showed any S&P 500 stock or liquid ETF (non-inverse, non-leveraged) that triggered one of the systems that day. 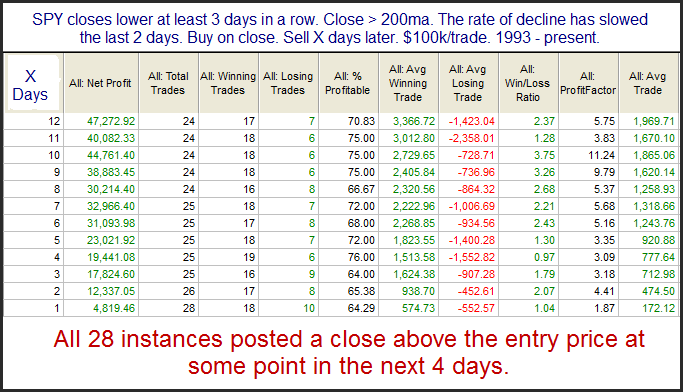 This spreadsheet is updated each night and is a frequent source of trading ideas for many subscribers. 4) 2009 - The Archives. The archives pages allow subscribers to pull up any subscriber letter back to the 1st one on 2/25/08 and see what was written. This came in handy for subscribers who felt the current environment was similar to one I had discussed previously and wanted to see what I’d written then.